Well today a number of targets were achieved, we managed to get the amidships iron ballast long bar totally uncovered. This enabled us to inspect it and it was of stepped shape, probably made of numerous iron ballast bars which had concreted together in seven rows. The length was 3.46 meters and width 0.85m and it stopped just before the break. This leads into the next question is there a matching one on the port side and does it run forward into the bow section? Is this why the front section forward of the shot locker and main mast is still intact and has a hull shape under all the tons of rocks. Is it because there is iron ballast under the rocks which is supporting them and taking the weight off the timber floors and futtocks? Other members of the Team started survey work beyond the grid to seaward to see if the anchors could be found. 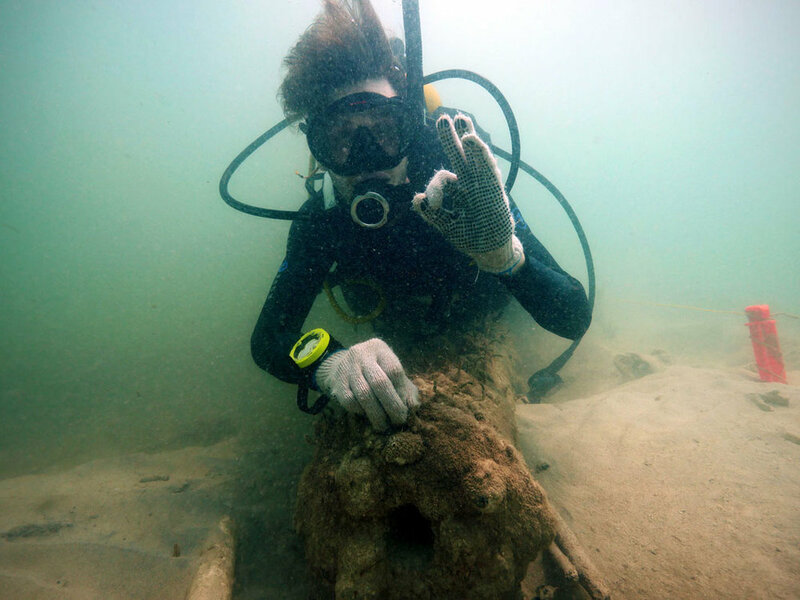 So far we have not located them but 23 meters north of the grid on the presumed stern section we found two pieces of hull planking about 2 meters in length with copper sheeting on. These were buried in the sand and the current hypotheses being that these were sections which landed here as a direct result of the explosion. 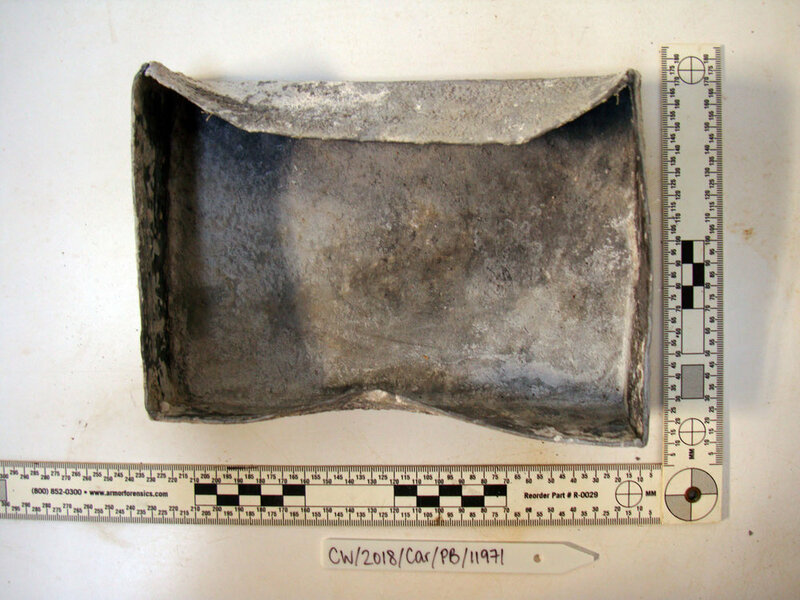 Further survey work resulted in a piece of French faienceware being found in the sand with pieces of small copper sheeting about 53 meters from the amidships break. This could give us an indication of the blast radius. One interesting find was a lead box without the lid. It was located next to some iron ballast bars, with the ballast bars holding it in place. Tomorrow further searching will be undertaken to see if there is a lid to the box and hopefully there might be some inscription on the box. Well, my thanks go to Connor for doing the diving blog so far and now that he has departed for the other side of the world, I have to take up where he left off. No guarantee it shall be so eloquent. The new Team had arrived and they were quickly brought up to speed on the wreck site and what had been learnt so far. It was also great to have PhD student Florence Prudhomme with us. She is finalising her thesis on Le Dragon and the epic history of the ship and the Captain and was following on from my hypothesis on the wreck, which I published in my PhD thesis back in 2004. This was her first dive on the wreck site so she was really excited. As usual, we had to adapt to the constant changing wreck site and the difficulties that we faced. One of them was the fine mud silt which was deposited over the centuries from a small stream running down to the beach. This was intertwined with sand from the sea meaning that as we hand fanned or tried to uncover anything clouds of silt would be created. This created poor photographic conditions much to our annoyance. Today we started to uncover two parallel gradiometer hits which seemed to be equidistant from the keel. We also were thankful for the storm which had uncovered about 7ft of vertical coverage over the wreck site, which unfortunately had been deposited on the bow area. This meant that after three days of uncovering we still did not get to the bow or the figurehead and so I decided that we would relocate to the stern section where we had established an archaeological grid and were slowly documenting items which were protruding from the seabed and in an uncovered state. In fact, if it was not for the storm uncovering the site we would have had a hard time to get down to this level. 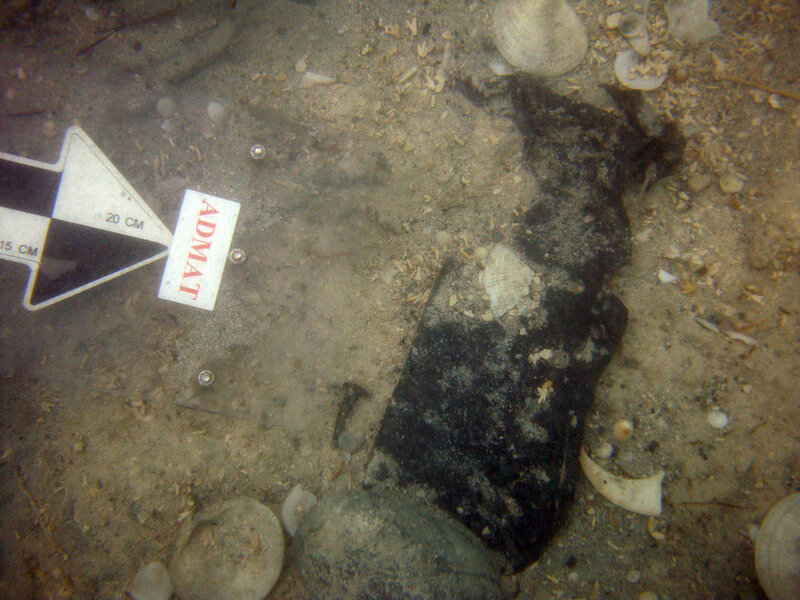 The port side was visible as well as the sandbags and grid from the 2000 survey. The starboard side which had not been seen before was also now exposed making documentation easier. As to the area around the stern of the ship, this area had also been uncovered leaving a number of gradiometer hits to be discovered. These turned out to be iron ballast bars, sometimes known as “kentledge” and came from strips known as pigs, so they were also called “pig iron”. There were two sizes small and long and both had holes in them at either end, used for lifting and positioning in tight spaces at the bottom of the ship. So today we started defining these artefacts which were numerous as well as the two parallel large hits. These turned out to be different sizes of ballast bars joined together and it appears there may well be a mixture of small and long bars concreted together and some even longer. We did not have time to uncover all of the long parallel bars just the starboard side. We still do not know how far they run to but it appears that they continue to the amidships break. However, it was interesting that the ship had a mixture of iron ballast bars and stone ballast. Tomorrow we aim to finish uncovering these long parallel iron bars. The moment I had been dreading had finally come. It was the last work day of the first two weeks and the last time I would dive on “Le Dragon”. It seems strange to say, but when our time was finally up and I had hugged the last cannon goodbye, I could feel a sort of choke in my throat in amongst the rising bubbles. By this time, “Le Dragon” was much more than a work site to me… she was home. The day passed uneventfully for the most part. 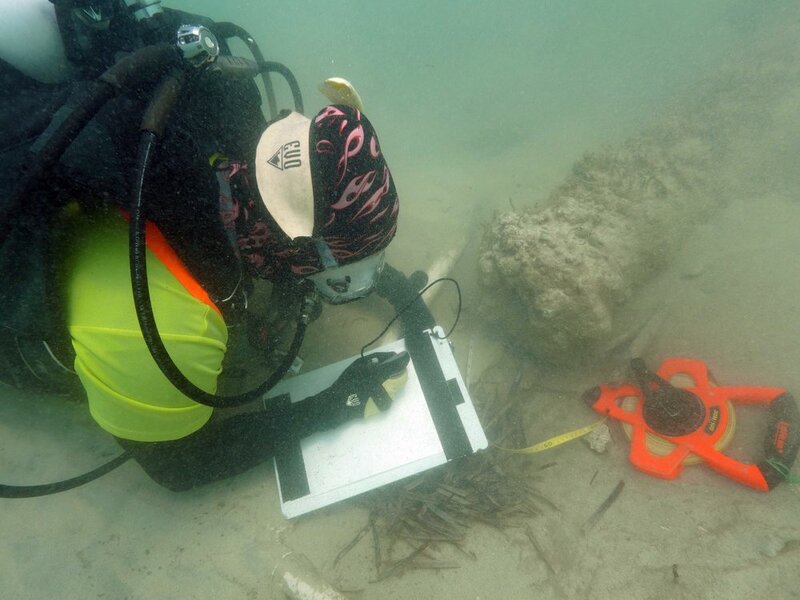 We continued work on the dredge and hand fanning the main grid, while others used the metal detectors and gradiometer to probe the areas around the 100 and 200 meter reference marks we had made. Unfortunately, no hits were made. The other objective was measuring the exposed port and starboard sides of the ship. Thankfully after tidying up the protruding wood planks, we could see a beautiful row of futtocks and floor beams in good condition. However, as the day went on... the visibility got worse and worse until you literally had to sketch the planks with your face pressed against them. 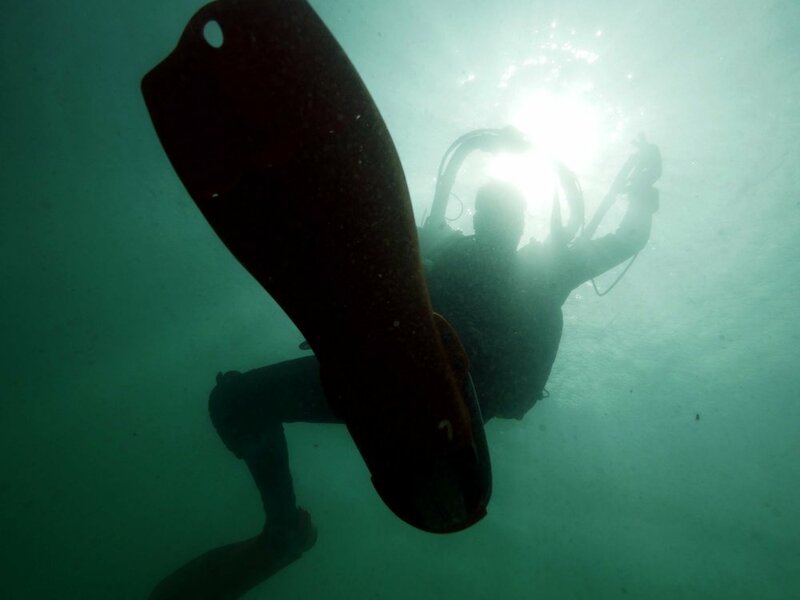 This was another case of taking something that seems so easy on land, such as measuring, and finding there are plenty of different challenges when doing it underwater. And just like that, Phase #1 was complete! After finishing on the wreck, we headed home and celebrated the night at a local bar. For most of the ADMAT team, this was the beginning of changeover, a time where the now battle-hardened recruits would shake hands with the new volunteers. Nevertheless, it was still a bittersweet time as parting was like leaving family. 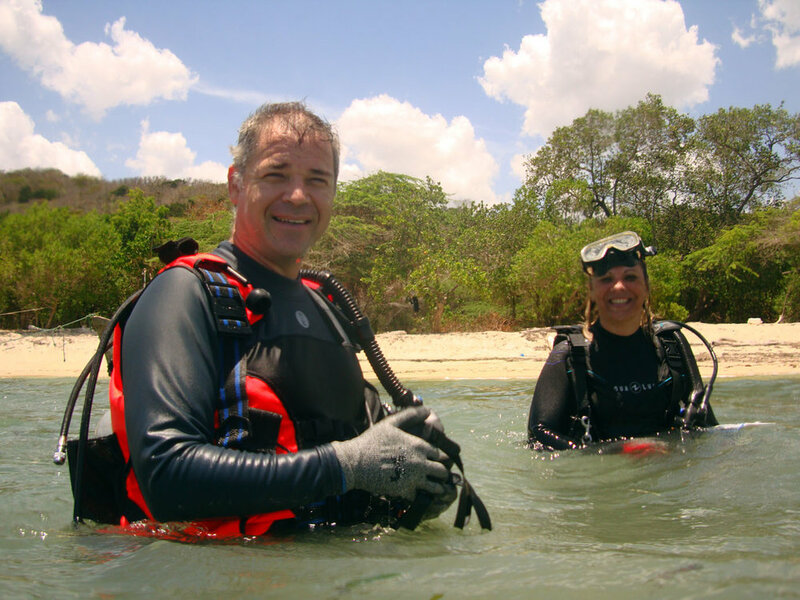 The collision of archaeology, scuba diving, and the colorful Dominican culture all in one place is certainly an experience. And yet as crazy as it is, there’s nothing quite like the adventure and fun that comes with it! When people ask me, “what was your favorite part?” I can only look at them and reply “All of it.” There simply is not one without the other and thanks to ADMAT, I will never forget this experience! There’s a peculiar feeling, being submerged in a moment of history completely frozen in time. I remember hand fanning the silt from a row of wooden futtocks on the side of the wreck and glancing over my shoulder at a 300 year old cannon lying beside me. Suddenly something clicked inside me and I realized this wasn’t just something you saw in the movies… I was actually working on a real live shipwreck! Easily distinguished from the ivory Caribbean sands in the ocean, the “Le Dragon” wreck protrudes from the shallow reefs like a broken gangplank. Most prominent is the ballast pile, a mountain of small stones responsible for the ship’s weight balance that stretches over the wreck. Second are the formidable 9 pounders Carron iron cannons on the surrounding seabed. These cannons were instrumental to the ship during the long investigation through the archives before it was finally discovered as ‘Le Dragon”. Despite the fact half of the ship was blown up in Captain L’Espine’s valiant attempt to save the spy onboard and the secret orders from the King of France, and that the worms had greedily eaten through most of the deck, the bottom floors and futtocks remain remarkably intact. The sratboard and port sides had been uncovered by a past storm which saved the Team a lot of time uncovering it. We had to clean off the algie growth which revealed some of the remaining lower hull assembly. This not only gave us a clear perspective of the port and starboard sides of the ship, but also enabled us to track the keel through the middle of the ship. Days 5 & 7, we began the initial excavation of “Le Dragon”. 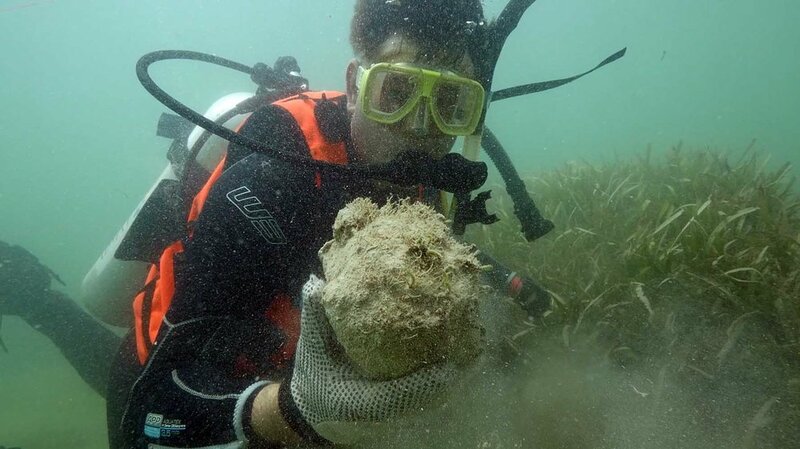 After locking in our first survey grid to the north of the amidships, break we began hand fanning the squares and probing the seagrass encroached area for any finds. Despite the fact progress was slow; the search yielded two interesting finds - a lead box just off the survey grid and pulley wheel that could still rotate was located near the bow section! Meanwhile, off the starboard side, the metal detectors and gradiometer were utilized to pinpoint numerous hits of ferrous and nonferrous metals. Marking these hotspots with coloured flags, we were able to visualize possible artefact locations buried beneath the sand. Of course, the biggest job was installing the dredge and starting the process of locating the bow (front) of the ship. While we had a good idea of where it was from the 2000 operation, we hoped by uncovering it again we could establish a reference point to aid our renewed excavation. Unfortunately, after sucking through the first few layers of sand we stumbled upon a massive log that had settled over our target area. This caused us to change position, but further down we encountered another obstacle… a local Dominican fishing boat that had sunk right on top of the bow! As frustrating as this was, we couldn’t help but laugh at the fact we now had two shipwrecks pancaked on top of each other. 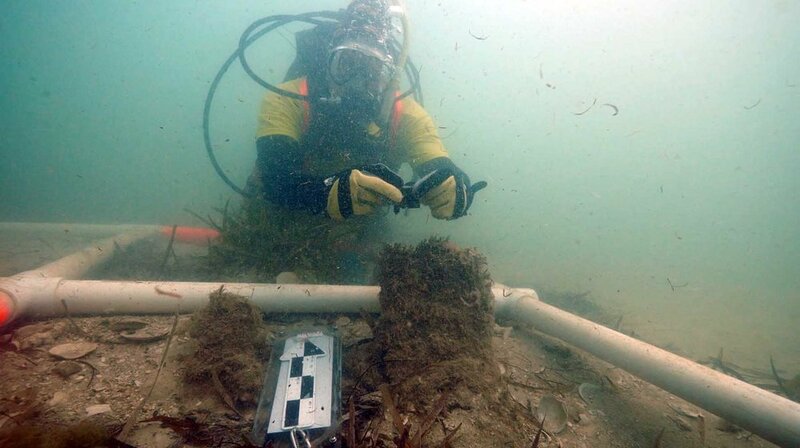 This also proved the golden rule of maritime archaeology... that Murphy’s Law reigns supreme. Anything that can happen will happen - so don’t ever be surprised. And in our case, that’s exactly what happened. Our boat was delayed and there were some complications with work site logistics. Nevertheless we worked around some of the setbacks and soon enough things began to fall together. The boat was being delivered, the trash pumps for the dredge sorted and the geophysical equipment ready to be deployed. We had our first dive on site and confirmed that a storm had actually uncovered certain sections of the wreck, making our surveying work much easier in some places. In one particular case, the sea bed which previously buried starboard side of the ship had even been lowered by several feet! While this was good news for the most part, we could not properly evaluate whether the site had also been damaged as a side effect of the storm. The true story would have to wait until the site was surveyed and partially uncovered. 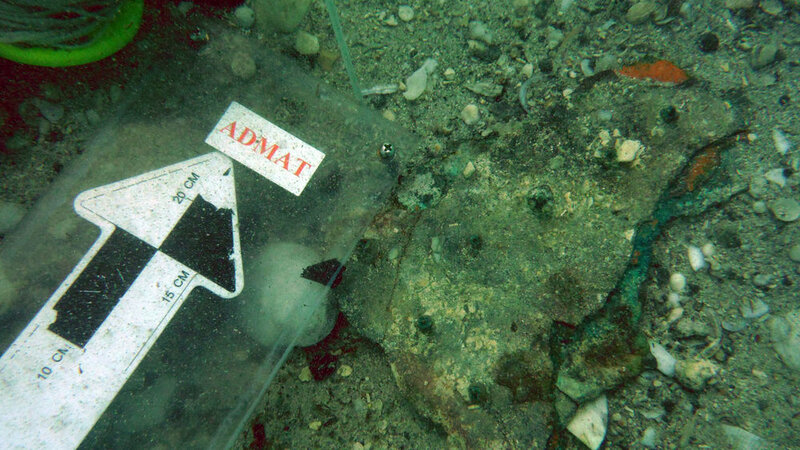 Back at the ADMAT facility, there were some other chores to do with preparing the lab for future artefacts liberated from the wreck, and cleaning preservation and desalination tanks. Less than a week to go before this exciting Le Dragon project starts. Tonight we had the last of the Team conference calls, going through key points before we all arrive for the start of this epic maritime archaeological project. The graphics of the Captain and Le Dragon from Connor Grzesiak and Jared Adamo who were using gofundme.com for raising funds for equipment. This year the Team come from England, France, Canada, USA, Dominican Republic and Australia. 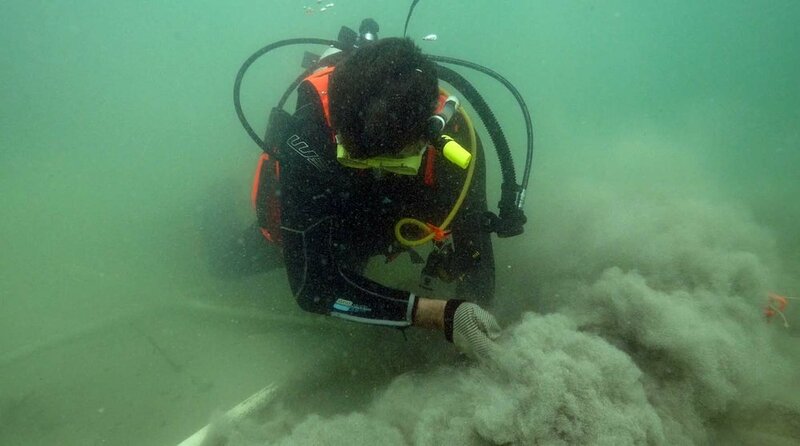 The Le Dragon wreck site on the north coast of the Dominican Republic, which will become a major maritime archaeological site during July 2018. The plan is to survey the starboard side of the wreck and see if we can prove the wrecking process from archival information researched into the important battle where Le Dragon was chased by 14 ships from the English Admiral Hood's Caribbean Squadron. In the end Le Dragon was chased for two days by a third rate ship of the line a 74gun as well as a smaller 54 gun ship from the English squadron, as well as the remaining squadron blocking all escape routes.